Parent engagement in a child’s learning has demonstrated positive effects on the child’s educational, social and long-term employment outcomes. Yet with students from vulnerable populations as much as two and a half years behind those from high socioeconomic status backgrounds, enabling parental involvement is not easy. Uplift: An Empowerment Approach to Parent Engagement in Schools, by Susan Maury, has just been published by the Good Shepherd Youth and Family Service in Australia. It details the piloting of an empowerment methodology that focuses on the parents’ voice and viewpoint. The research process ran three workshops in which the parents created a vision for their children’s school years, then identified actions that families, schools, and the community could take to better support their child’s holistic development. This process became a leverage point for community action, with members working collaboratively with different agencies to achieve steady and sustainable community change for the benefit of their children. How can international aid professionals deal with the daily dilemmas of working for the wellbeing of people in countries other than their own? Rosalind Eyben, a lifelong development practitioner seeks to answer this question. 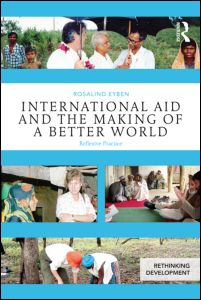 In this book she provides a vivid and accessible insight into the world of aid: its people, ideas and values against the backdrop of a broader historical analysis of the contested ideals and politics of aid operations from the 1960s to the present day. She examines her own behaviour to explore what happens when trying to improve people’s lives in far-away countries and warns how self-deception may construct obstacles to the very change desired. She proposes that those working in international development must respond self-critically to the dilemmas of power and knowledge that shape aid’s messy relations, and advocates the adoption of the habit of reflexivity in order to help make a better world. Published by Routledge, ISBN 978-0-415-65674-0. An understanding that the world is made up of an interconnected web of complex systems is at last creeping into development thinking and challenging the simplistic linear models that have for so long underpinned aid programmes. Ben Ramalingam’s book Aid on the Edge of Chaos, published last autumn, offers an in depth exploration of this whole new way of approaching aid and international cooperation. In addition, Ben and colleagues have just announced a six day course on Complex Adaptive Systems in Development which will take place in February 2015 in Brighton, UK. It has been developed to meet the needs of practitioners, researchers and policy makers working in development and humanitarian contexts. It offers them the opportunity to deepen their skills in the approaches, methods and tools employed by leading complex systems researchers. Organised by Partnership Matters, this is the first Barefoot course to be held in the UK. It will enable participants to improve their ability to listen deeply to others, understand their own behaviour and motivations and identify the stage their own organisations are at along with the most appropriate interventions to take. It will support their ability to assess different kinds of change and how to support them, along with how to address resistance and improve facilitation. It is an experiential and interactive course, encouraging participants to learn from each other and is open to people at all stages of their career in international development and social change. It costs GBP500 and booking requests should be sent to maryannmhina@gmail.com by 15TH AUGUST LATEST. Donors need to know that proposals are rooted in the identified needs of the target community. This course covers how to define, plan, and appraise a project and how to develop a proposal with a strong budget that encourages ownership by key stakeholders. It will cover how to use the project cycle to develop a project proposal in a participatory way. Mango will deliver specific sessions on how to develop a budget in line with project objectives and activities. This book is an account of the activities carried out by the Participatory Research Group (PRG) within the Participate initiative between 2012 and 2014, and also a reflection on the methods and processes created and utilised during that time. It aims to share the insights and lessons learnt to help promote thought and discussion about how to use participatory approaches to research poverty and influence policy at a variety of levels. It is available as an Open Access publication. 25th to 27th August 2014, and 17th to 19th November 2014. The Institute for Development Practice and Management (IDPM) of PDA Ghana is hosting two 3-day workshops to introduce the basic principles of Outcome Mapping, and how they can be applied to the planning, monitoring and evaluation of development projects and programmes. The training is designed for programme managers, desk officers and field staff from CSO’s NGOs, funding agencies and national and international development organisations looking for effective ways to address the dynamics of change in the complex environments in which they work. Both workshops will be held at the Paloma Hotel, Kokomlemle, Accra, Ghana: for more information visit the IDPM website. In this pioneering collection, writers from Africa, Latin America, and the Middle East are brought together for the first time to talk explicitly about women’s participation in the political scene across the global South. Answering such questions as how women can get political apprenticeship opportunities, how these opportunities translate into the pursuit of a political career, and how these pursuits then influence the kind of political platform women advocate once in power, Women in Politics is essential reading for anyone interested in what it means to engage politically. Published by Zed Books and available from the IDS Bookshop. The tendency for programmes intended for those who are poor and marginalized to be distorted and captured by local elites is widely recognized. This short article written for UNRISD looks at how participation can provide some answers to overcoming the tendency for elite capture in social protection programmes. Go to the UNRISD website for the full article.